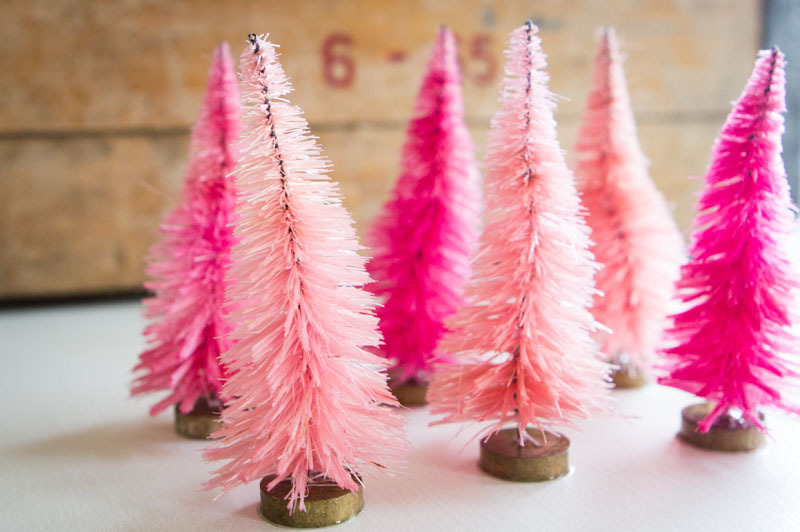 How gorgeous are these pretty pink bottle brush trees? Rebekah from A Bit of Sunshine came up with this adorable tutorial for how to bleach and dye them any color you’d like. Her only warning is that they are highly addicting to make. That’s a warning I’m totally okay with. 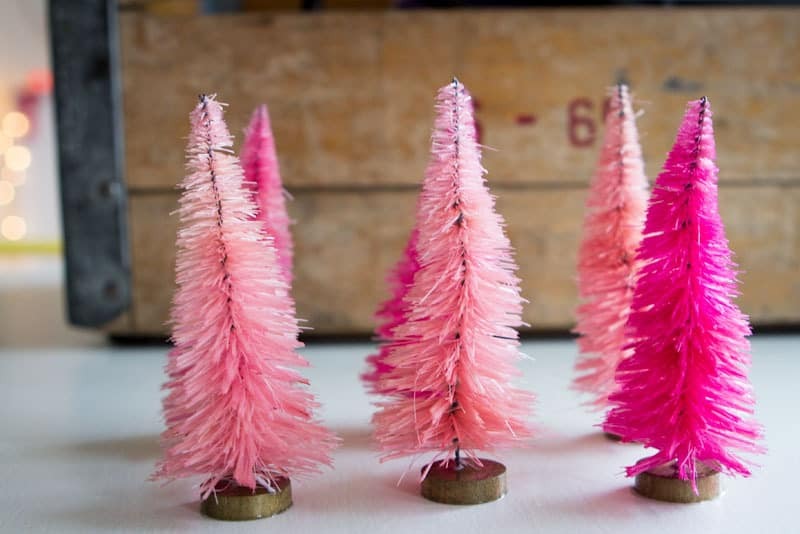 You could turn your mantel into a lush fuschia forest in an afternoon. Keep up to date on Rebekah’s holiday crafting by liking A Bit of Sunshine on Facebook and following her on Instagram – Rebgough. She has some great photos to get you into the holiday spirit. Bleaching and dying my own bottle brush trees was something I had wanted to try for a really long time. I had seen a few tutorials floating around but was still a little bit apprehensive fearing I would ruin them somehow. But when I found a big bag of trees for only a couple of dollars at the thrift store I decided it was high time to dig in and experiment and I ended up absolutely loving the results. Here’s a warning, these are super easy and addicting to make! To first bring the trees to white I put them in a bath of water in the sink with a generous splash of bleach (maybe 1/4 of a cup) and let them soak, using some tongs to stir them every now and then. At about 15 minutes I took those two light green ones out because I loved the color they had turned but the rest stayed put for about an hour and a half until they were all creamy white. I rinsed them in water and set them on a tray to dry. 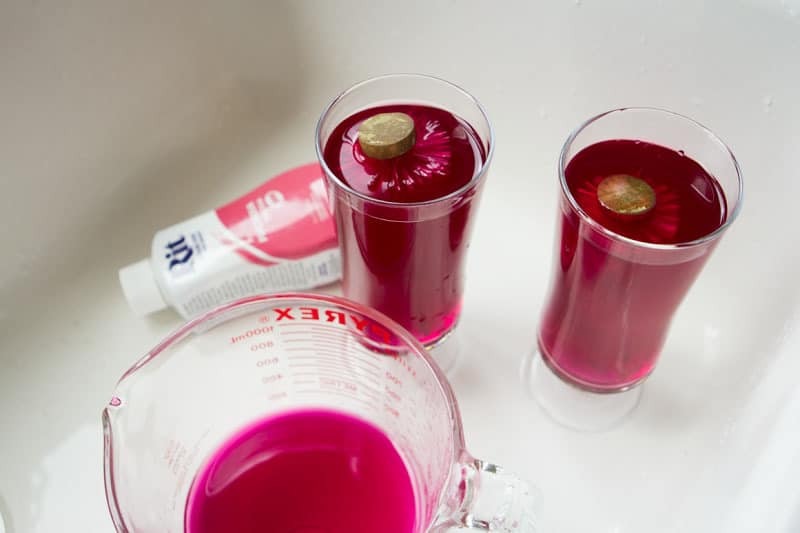 To make them pink I simply put hot tap water into a Pyrex with a bit of liquid Rit dye (fuchsia) and stirred. Then I poured some of the dye into two tall glasses and turned the trees upside down in each letting them sit anywhere from 1 minute to about 15 minutes depending on the color I was going for. The longer you leave them in the dye bath the more saturated they become. 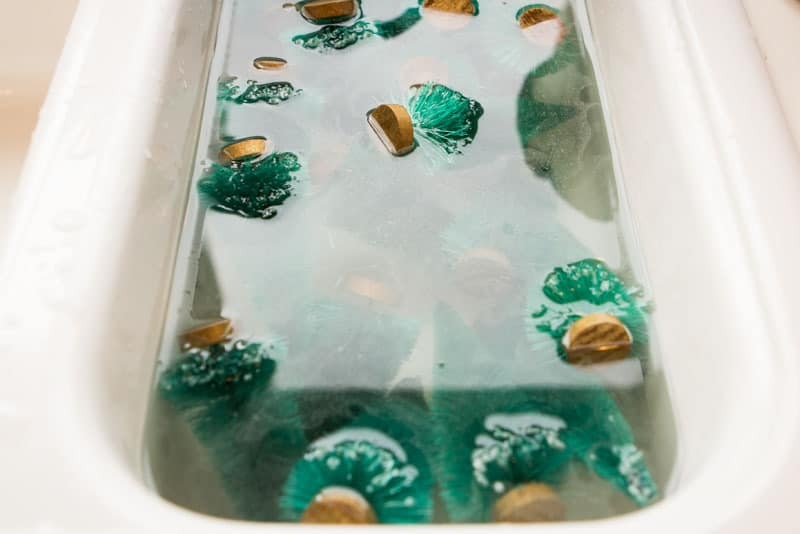 Lastly you want to rinse with cool water and set them to dry! In the end they were really easy. I hope you guys have as much fun as I did making a happy little forest! Next up for my set will be some glitter and glue. 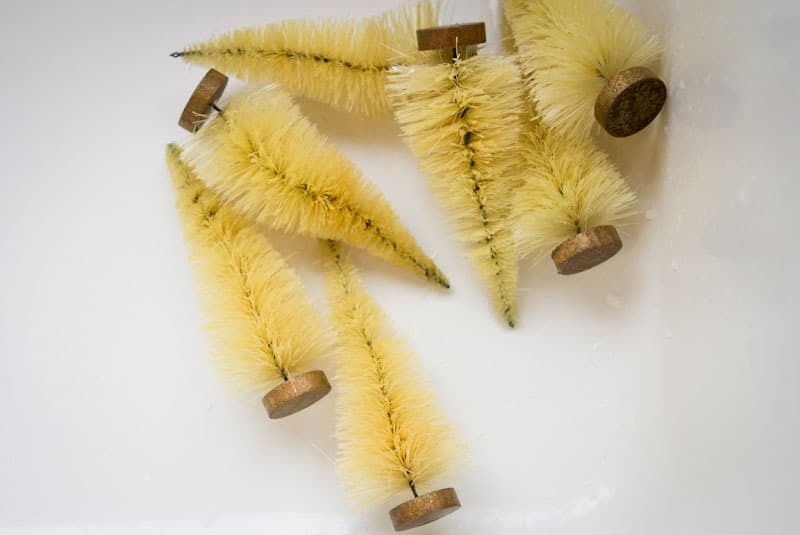 What about you, do you think you would ever try your hand at bleaching and dying bottle brush trees? Merry Christmas everyone! You read my mind! I, too was scared I was going to ruin them, so thanks for the dose of courage. BTW, if the trees have glass ornaments stuck on them, will the bleach process mess with them? 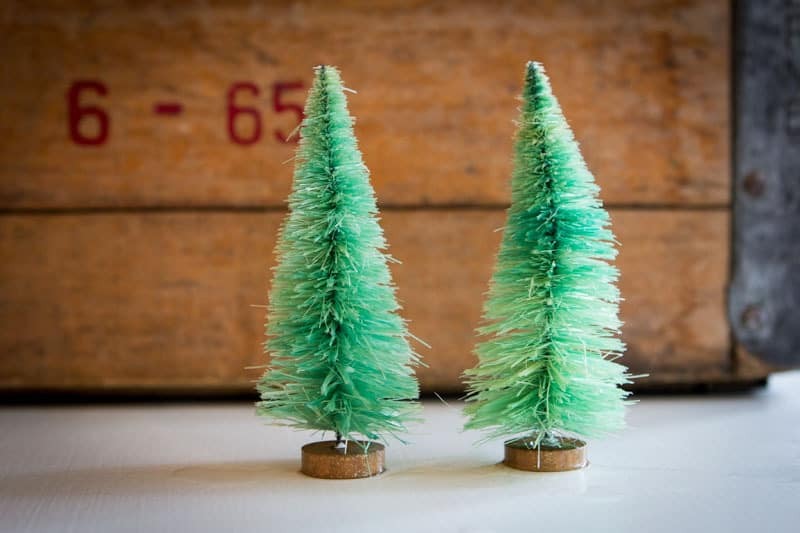 Ok so How do I Make Bottle Brush Trees? Dyeing is not the same as making.